A woman who met a drug dealer while in prison was arrested while allegedly dealing drugs for him in Sattahip. Royal Thai Navy drug-interdiction officers and personnel from the kingdom’s Unity for Victory over Drugs Unit arrested Surattan Srikatad, 27, with 400 methamphetamine tablets June 13. Surattan Srikatad (left) and Wichit Suaedee (right have been remanded to custody and charged with drug dealing. 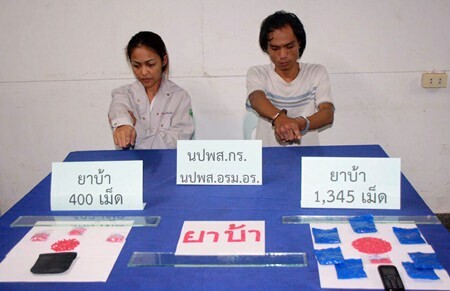 The Ban Chang native was apprehended following the arrest of her alleged partner, Wichit Suaedee, 25, who was captured with 1,345 ya ba tablets. He gave up Surattan during interrogation, police said. Police said Surattan confessed to dealing drugs for an inmate at Rayong Prison where she was imprisoned previously. Since her release, she’s been buying drugs at the prison fence, most recently a package of 20,000 pills, officers said.